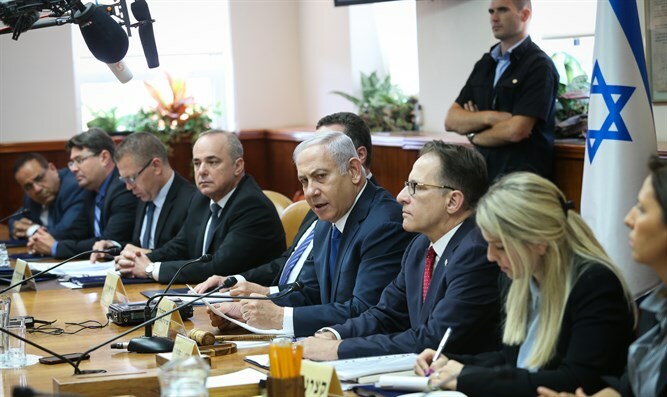 Prime Minister Binyamin Netanyahu at the start of today's weekly Cabinet meeting, referred to IDF action in Gaza. "Over the Sabbath we hit Hamas in a significant way, and hard," Netanyahu said. "Our policy is clear: Whoever hurts us, we will hit them with great strength. This is what we did yesterday. The IDF dealt Hamas the harshest blow since Operation Protective Edge. I hope that they got the message; if not, they will get it later. "I heard it being said that Israel has agreed to a ceasefire that would allow the continuation of terrorism by incendiary kites and balloons; this is incorrect. We are not prepared to accept any attacks against us and we will respond appropriately. "Yesterday I spoke with US President Donald Trump. We discussed security and diplomatic issues in light of developments in the region, with Syria and Iran first and foremost, of course. "As you know, these issues will also come up at the presidents' summit in Helsinki. Of course I discussed them with President Putin last Wednesday. I thanked President Trump for his strong policy against Iran because since this policy has been taken, we have seen a great effect on – and inside – Iran. President Trump clearly reiterated his commitment to the security of Israel and his willingness to help the State of Israel in various fields and, of course, I thanked him for that. "Today I will be pleased to host Nick Malyshev, the Head of the OECD Regulatory Division. He has come to Israel in order to present a report on the regulatory situation in Israel. The OECD has found that Israel has achieved much in reducing regulation in recent years, thanks to the many efforts all of us here have led together. We will continue to work to cut bureaucracy for the citizens of Israel."